With the next big Pokemon Sun and Moon announcement coming this Friday, I certainly didn’t expect to get new Pokemon Sun and Moon news this early. But now the current issue of CoroCoro Magazine has been leaked online. And well, with four new Pokemon and a villain team to cover, this should be somewhat interesting, shouldn’t it? So let’s start with the new Pokemon first. Or more precisely, the ones that might somewhat split the fanbase’s opinion a little. Because you know how for years, people have complained about object based Pokemon? Like say, Klefki being a living keyring? Or Vanilluxe being a sentient ice cream cone? Well, then they won’t like these two Pokemon much. 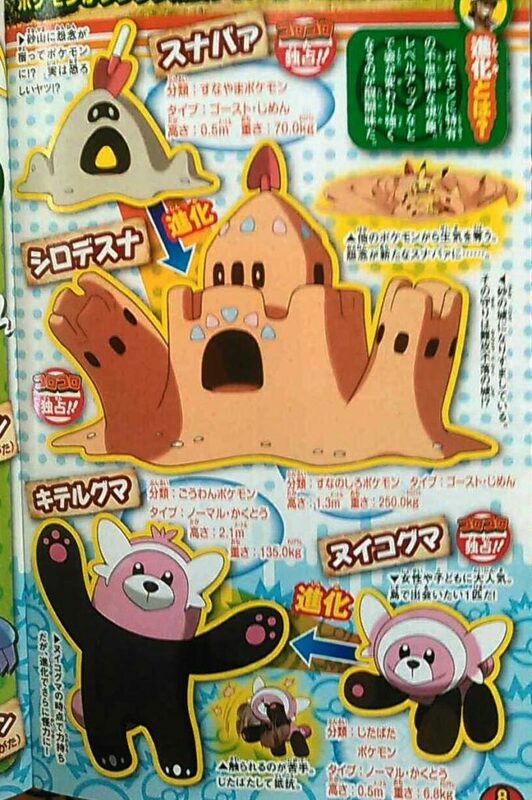 Sunabaa is the sand hill Pokemon, and Shirodesuna is the Sand Castle Pokemon. Both are Ghost/Ground types. 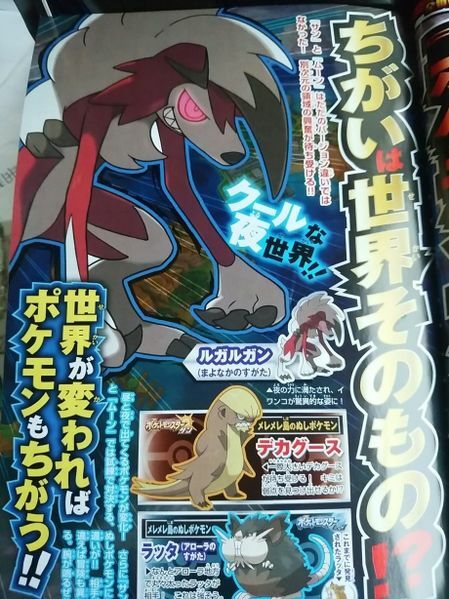 And as seen above, we also now know Bewear’s pre evolution. 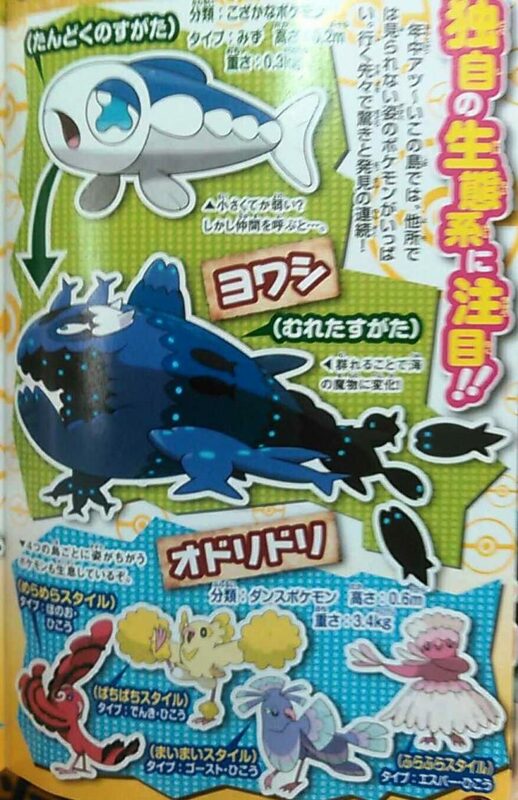 It’s called Nuikoguma, and looks just about as you’d expect a cub version of Bewear to look. Nothing interesting, but a decent enough new species none the less. It’s a pretty interesting ‘gimmick’ for a Pokemon species, and it makes you wonder just how you switch between them (or what the effects are). Do you summon other Yowashi in battle to help out? Like the Totem Pokemon you fight in the Island Trials? Or is it something more traditional? Either way, it’s going to be interesting to see how this plays out. In addition to new Pokemon, we also have a few new Alolan species of familiar ones. Like Alolan Meowth, which is now a Dark type. Apparently the change gradually occurred after being bred by Alola’s royal family. There’s also a new Alolan Marowak, confirming our earlier suspicions. This Ghost/Fire type gained its unusual typing to protect itself from the region’s predators. Guess Ground type isn’t so viable in an island archipelago filled with bird like Pokemon and surrounded on all sides by the sea! Another bit of information revealed today is in regards to the area’s villain team. Because you see, due to the change in gyms, some people were expecting the villain plot to be taken out as well. As for the female member of the team, she’s named Burumeri. No word on what ‘rank’ she has in the organisation. Or for that matter, what Team Skull hopes to achieve in general. Presumably it has something to do with Solgaleo and Lunala. Finally, an interesting ‘hint’ about Rockruff. For the last few months or so, there has been a lot of speculation about what it evolves into, as well as if it has two different evolutionary branches. Heck, some people are even saying it’ll evolve in a werewolf in some circumstance or another. 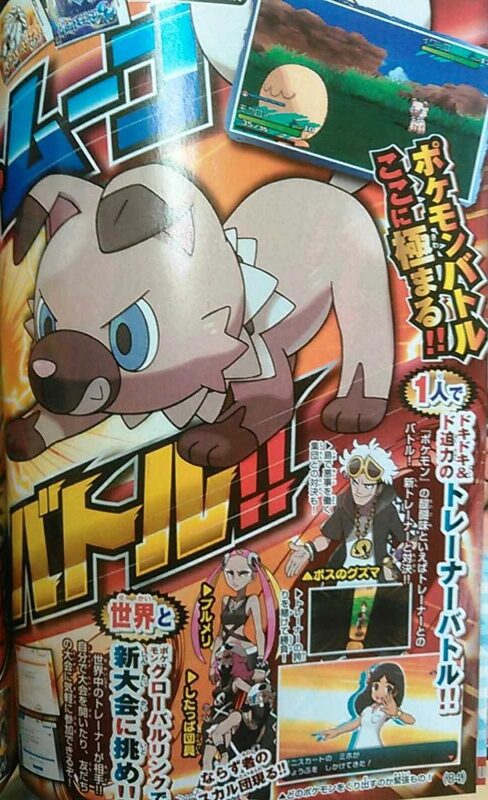 Well, it seems like CoroCoro Magazine has confirmed that something interesting happens on that front. Why? Because the next issue will apparently contain a poster featuring its ‘secret evolution’. Based on that wording, it seems likely that it will A: have more than one form and B: have a special method that’s needed in order to evolve into the second one. So yeah, that’ll be something to look out for next month. But for now? 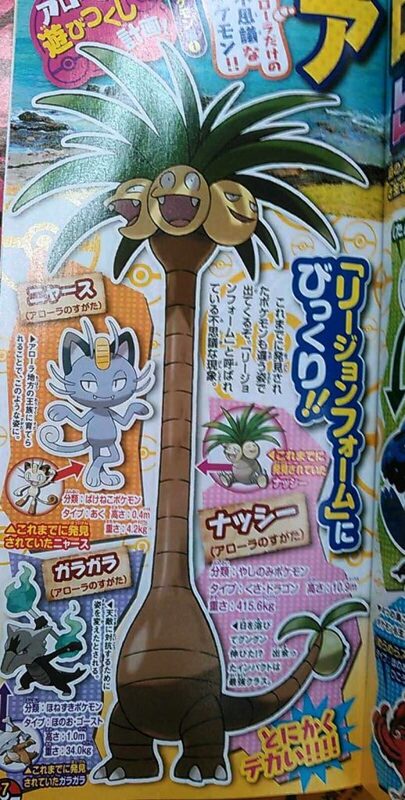 That’s everything in the leaked CoroCoro issue. Four new Pokemon, two new Alola forms and the villain team for the new region. It’s not a huge reveal, but it’s enough to get people talking about the game, isn’t it? What do you think about the new Pokemon and villain team? 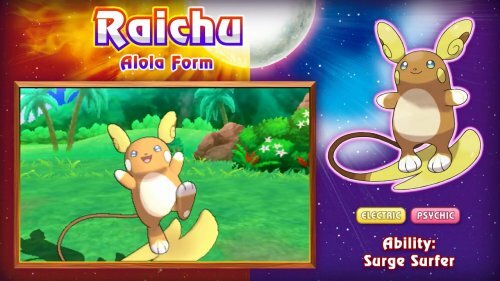 Alola Raichu Leaked for Pokemon Sun and Moon? 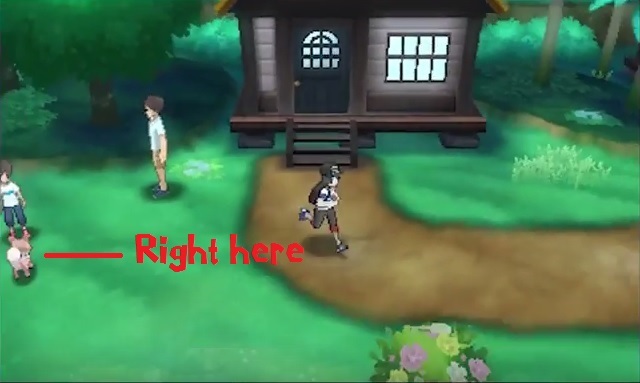 New Pokemon Leaked in CoroCoro Trailer!